Photo by Wikimedia user Happyme22 used under a CC BY-SA 2.0 license. Two GW students are spending their summers inside the White House halls, rubbing elbows with top employees of the executive branch. Gidon Feen, a rising sophomore from St. Louis, Mo., and Michael Weir from New Bern, N.C., are two of the 136 White House summer interns this year who are working in departments like the Office of Communications and the Office of the Vice President. Like last year, the White House accepted just two GW students for the summer program, fewer than during the fall and spring semesters. Eight students interned at the White House last fall and five this spring. Georgetown and American universities both beat out GW in intern count, with four and three students, respectively, interning at the White House this summer. Harvard University fielded the largest number of interns, with 21 of the 136 interns attending one of its colleges. Princeton University landed in second place, with nine interns, and Brown rounded out the top three with seven. 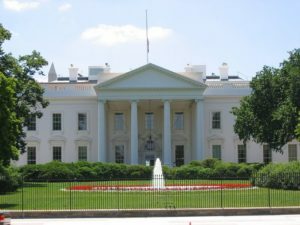 “The mission of the program is to make the White House accessible to future leaders around the nation and to prepare those devoted to public service for future leadership opportunities,” the White House said in a statement. Applications for the fall 2014 internships have closed, but students can apply for the spring 2014 internship until early September.